Damien Brunner and Brendan Smith scored in the second period and the Detroit Red Wings beat the Chicago Blackhawks 4-1 Saturday in Game 2 to even their Western Conference semifinal series. 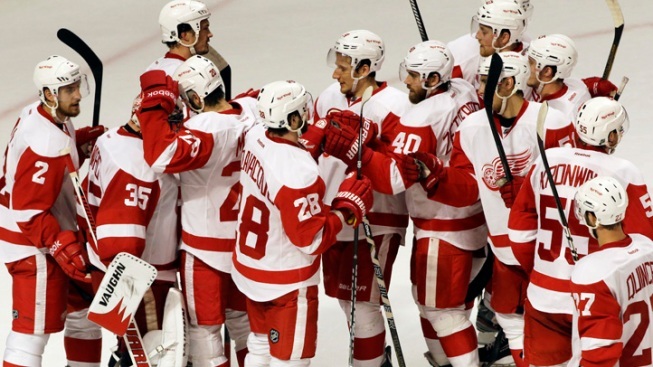 It was a strong response by the Red Wings after Chicago handled them easily in the series opener, 4-1. Just as the Blackhawks did in Game 1, Detroit took control in the second period and put the game away in the third. Now, the Red Wings have a chance to take the lead when this series between Original Six rivals shifts to Detroit for Game 3 on Monday. Patrick Kane gave Chicago a 1-0 lead late in the first, but did things ever change after that. Brunner tied it when he deflected a wrist shot by Jakub Kindl early in the second, and Smith gave the Red Wings the lead when he scored off a feed from Henrik Zetterberg on a 3-on-1 late in the second. Johan Franzen made it 3-1 in the third when he fired a rising shot past Crawford after a perfect pass from Jonathan Ericsson in the Detroit zone. And Valtteri Filppula closed out the scoring with 7:57 left in the game. That was enough for Jimmy Howard, who stopped 19 shots. Crawford made 26 saves for Chicago but the Red Wings were simply a step faster in this one after the Blackhawks ran away from them in the opener. The Blackhawks still struck first thanks to a lucky bounce after Detroit's Kyle Quincey sprawled out to block a pass across the slot by Patrick Sharp that was intended for Kane on a 2-on-1 rush. The puck bounced to a trailing Michal Handzus, who immediately fed it to a wide open Kane in the right slot. He fired it into the net at the 14:05 mark for a 1-0 lead and his first goal of the playoffs. About a minute later, with the Red Wings on a power play, Crawford made a nice save on Zetterberg before Pavel Datsyuk ripped a shot high off the right post. Detroit tied it early in the second when a wrist shot by Kindl from just inside the blue line deflected off Brunner and past a screened Crawford, who didn't even react as the puck went past him on the glove side. But Chicago's goalie had the fans chanting his name midway through the period with two great saves, stopping Zetterberg from the slot and sprawling out to foil Daniel Cleary on the rebound. The Red Wings took a 2-1 lead with 3:52 left in the second, when Zetterberg dished to Smith on a two-on-one rush after Chicago's Niklas Hjalmarsson fell racing him for a loose puck. Notes: LW Drew Miller was in the Red Wings' lineup for the first time since April 20. He had been sidelined by a broken bone in his right hand. ... F Viktor Stalberg was a healthy scratch for the Blackhawks, just as he was in Game 1. "I don't like changing too much, but we wanted to get (Dave Bolland) in our lineup," coach Joel Quenneville said before the game. "It's comparable to what we've done during season. But we'll see. We can adapt and change at any moment." ... Quenneville on the early start: "I think the guys, once they get in, they don't mind playing in the afternoon."